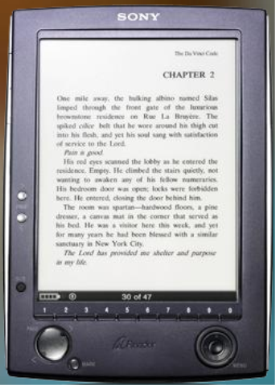 I'm sitting in a cab right now on the way to a large NW Bank (I'm using Verizon Wireless on my laptop, which is working quite nicely, BTW) and I am coveting the Sony Reader, or what I personal call "eBooks last chance." At least, until another generation of early adopters lives and dies and forgets (or at least chooses to) the sins of the father. Besides the expense, which is currently US$350, the real issue will be one of content. How many books are available? To quote the guy at Borders "Well, all of them. The whole store." I can't confirm that claim, but I did check out the Connect eBooks Sony Store and it does seem to have a lot of books. I wonder why Sony didn't just work a deal out with Amazon, who was already dipping their toes into the eBook pool, and may just jump in completely with the Amazon Kindle. The Kindle is looking pretty rough right now, but it's early. Aside: Kindle? Seriously, could the marketers at ordinarily-savvy Amazon come up with we a limper name? How about Amazon Not-Dead-Tree? Amazon Vue? Amazon Perspective? Amazon ePaperBack, for crying out loud. Amazon Kindle sparks (sorry) images of burning paper, not exactly the kind of environmentally friendly eBook perspective you'd want. If it were US$99 or US$150, sold. $199, eh...getting dangerously out of the WAF range. Considering that I carried 3 books with me on my last three business trips and they were a hassle in my backpack, I could totally see using this little gadget, but it's really expensive at $350, although you do get $50 in free books. As a big book fan myself, it is very interesting, but you are right, it is pricey. In checking the Sony Reader site, on the promotions page, flash panel, or whatever you call it, it mentions $100 cash back if you apply for the Sony Visa card (and you can use the $100 toward the purchase). I couldn't make out the fine print however. It look every blurry on my display. I looked as if the offer expired in January 2005 which really wouldn't make sense. Anyway, assuming the offer didn't expire in 2005, $250 is better is closer to your range. Still way out of the range for me, but if the product is a hit we'll likely see $99 this time next year. Reading eBooks... Everybody wants to use it to read eBooks. Am I the only one Earth who's looking for a device to read files in bed or in a sofa ? Yes, RSS but not only: All PDFs, white papers et al. that pile up because I really don't like to just read on a computer screen. And even though I'm not an early adopter, I'm ready to shell out the money. I checked the Sony eReader but didn't like it too much. No search or bookmarking features. The Iliad from Irex Technologies is a nicer one albiet more expensive eink device. I read complaints about broken zoom feartures for pdf on the Sony device. You really need zooming if the font used is too small. The way I would use the device is to convert html, chm or hxs (MS help files) to pdf. mostly technical stuff. There's also a common complaint about Sony's DRM stuff. You can always upload your own pdf files. I currently use my wifes laptop for reading in bed / on the sofa it has a 12" screen and weighs only 1.6kg the only problem is it gets a bit warm when placed on top of the duvet. In a couple of weeks I am off to Australia for a four week holiday so it would be cool to take a device like this with all my holiday reading material on it but the price is not viable, as it would eat too heavily into my holiday beer fund. If the did a deal where I could get 10 books included in the price then that make a difference. I've been reading nothing but e-Books for years now when it comes to reading for fun. Mobipocket works fantastic on phone, PDAs, and desktop, and I've been very pleased with the selection both on their site and on fictionwise.com with eBook titles from major authors. There are still a lot of titles I would like to get in eBook format, but I think a lot of that has to do with ignorance, fear, or superstition on the part of the authors or publishers regarding eFormats. abdu: actually, bookmarking is a feature on the Sony Reader. If people balk at $350, what will they think of $730 for the iLiad?